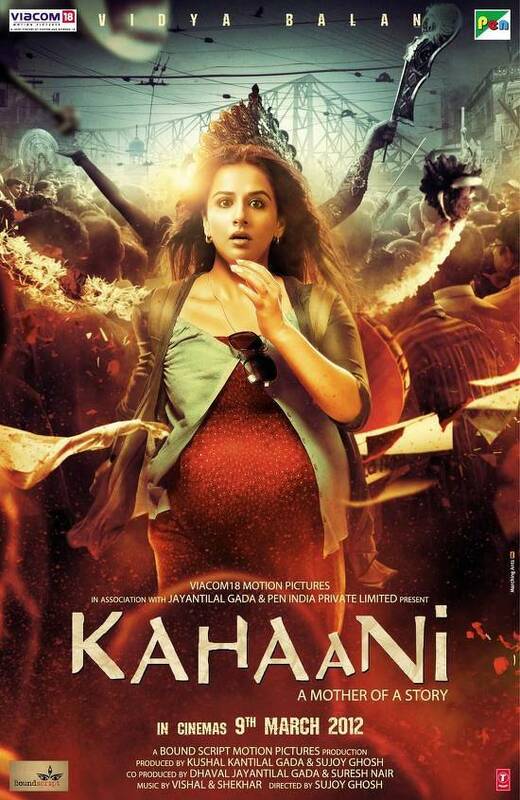 Time for women oriented cinema in Bollywood? Will Shahid’s fortune turn around with R…Rajkumar? Bollywood Releases on 14th March, all eyes on "Bewakoofiyaan"
Will Shahid's fortune turn around with R...Rajkumar? 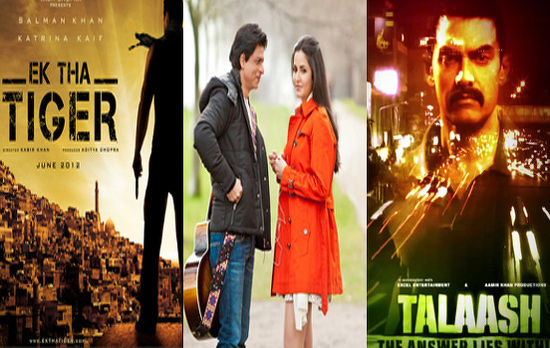 10 Bollywood Films To Look Forward To In 2013! 2012 was a great year for Bollywood. Not only did big films with big stars did well but small films with good content also clicked at the box office. As a new year, 2013 commences, we take a look at 10 films that we will be looking forward to this year! So here’s our list! You can go ahead and put your choices in the comments sections below. Chennai Express : Shahrukh Khan and Deepika Padukone pair up once again after Om Shanti Om in Rohit Shetty’s Chennai Express. The movie tells the story of a man who travels from Mumbai to Rameshwaram. We look forward to watch SRK and Deepika together again and considering it is directed by Rohit Shetty, this one is sure to be a big entertainer! 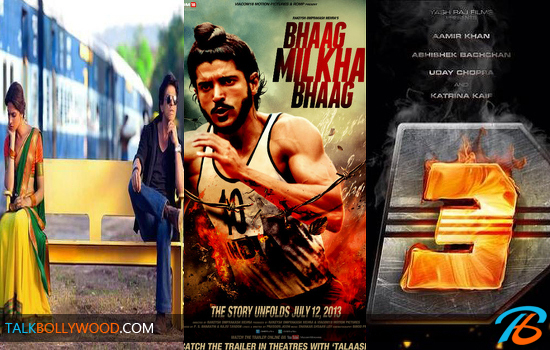 Bhaag Milkha Bhaag : The first trailer and posters of this biopic based on the life of Indian athlete Milkha Singh have been highly impressive. Farhan Akhtar has trained hard for the role and it’s amazing how similar he looks to the ‘Flying Sikh’ in the posters of Bhaag Milkha Bhaag. We are expecting this one to really good! Zanjeer : Yet another remake of an Amitabh Bachchan film, this one stars Ram Charan Teja and Priyanka Chopra. This will be Ram Charan’s first Hindi film and like with any other remake, we will look forward to see how different this one will be from the original Zanjeer. Dhoom 3 : After John Abraham and Hrithik Roshan, Abhsiehk and Uday will be seen chasing Aamir Khan in Dhoom 3. The movie stars Aamir Khan and Katrina Kaif together for the very first time. This one is expected to open big at the box office and we look forward to see how Aamir differentiates his character from the previous thieves of the Dhoom movies. Yeh Jawani Hai Deewani : Ex-lovers Ranbir Kapoor and Deepika Padukone pair up once again for Yeh Jawani Hai Deewani. Every year we look forward to at least one good love story from Bollywood and we think this might be it for 2013! The movie will release in May. Krrish 3 : Hrithik Rosham teams up with dad Rakesh Roshan yet again to bring in the third movie of the successful Krrish series. After Koi Mil Gaya and Krrish, we will get to watch Krrish 3 in 2013. The movie has been in the making for quite some time now and we hope that end result is even better than the previous two films. Krrish 3 also stars Priyanka Chopra, Vivek Oberoi and Kangana Ranaut. This one is not to be missed! Ghanchakkar : The movie makes to our list because of it’s lead pair, Emraan Hashmi and Vidya Balan who we think make a very good on-screen pair. Vidya plays a loud Punjabi wife in Ghanchakkar and considering how good she has been with her script sense in the last few years, we are hoping that she will not disappoint us with this one either. Ram Leela : Sanjay Leela Bhansali’s Raam Leela has been in news ever since it was announced. After replacing actresses, SLB finally found his Leela in Deepika Padukone. We look forward to this one because of the unique pairing of Ranveer Singh and Deepika. Also we hope that with Ram Leela, the director will finally get that elusive hit that he has been looking for. Once Upon a Time in Mumbaai 2 : The prequel was a surprise hit and now the makers plan to make the sequel bigger and better. Akshay Kumar and Imran Khan have been roped in to play the main leads and once again we will see Sonakshi Sinha romancing Akshay on screen. Satyagraha : A Prakash Jha film is something that we always look forward to. Jha once again teams up with his favorite actors- Amitabh Bachchan, Ajay Devgn, Manoj Bajpai and Arjun Rampal for Satyagraha where Amitabh is speculated to play the role of social activist Anna Hazare. Giving the actors company will be Kareena Kapoor who will be playing a journalist in the movie. So these are our top 10 films that we will be looking forward to in 2013. What about you? Vote: Which film are you looking forward to in the 2nd half of 2012? YRF and Ajay Devgn Films battle intensifies!